Revitalize yourself with Best beauty tips. Who doesn’t want to look beautiful and fresh? Being beautiful increase our self-confidence. But these days everyone is so busy that they forget to take care of their skin. The increase in the dirt in the environment affects our skin and damages it. The dirt particles get inserted in our open pores which creates a dirt layer on our face. We don’t have much time for their skin pampering and so they want something which cleans their skin and saves their time. We’ll help you to choose which cleanser is good for your skin and saves your time. 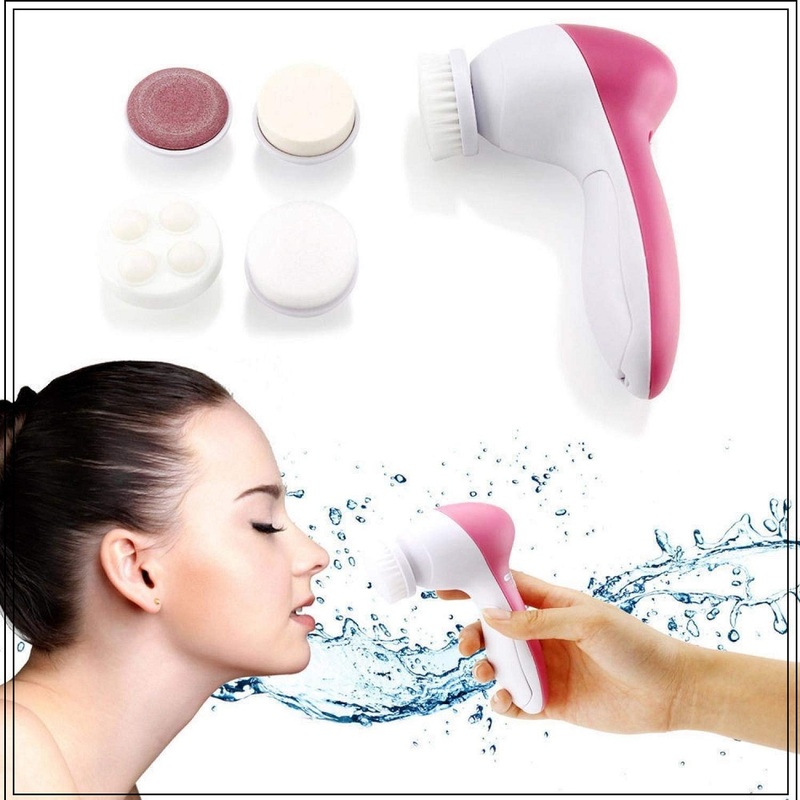 There are number of face cleanser available with different attachments. Each attachment serves a different purpose. Therefore it is necessary to know which cleanser to use and how to. Here are some for you. 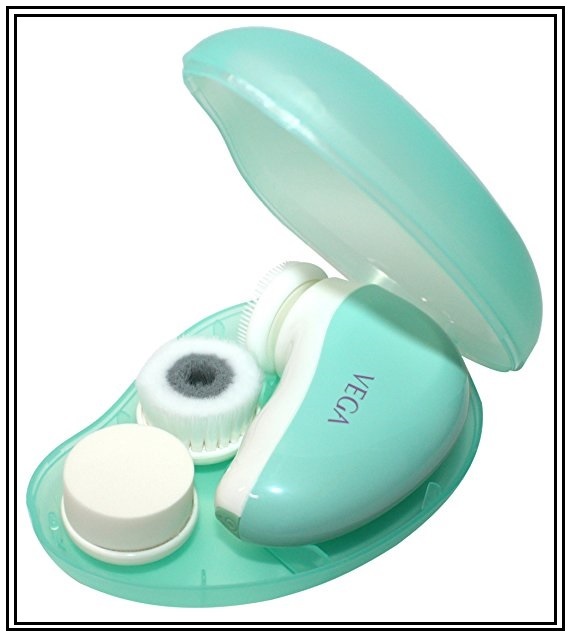 Vega faces pack brush is considered to be the best facial cleansing brush for sensitive skin as it has soft bristles. The most important advantage of Vega facial cleanser is that it is water resistant and it is lightweight. It has three head attachments such as Silicone Brush, Soft PBT brush and latex sponge which is helpful for deep cleaning. As it can be rotated in both the clockwise and anticlockwise direction, it would help in achieving clean skin. It is very expedient to use particularly during the travel. Using this cleanser will give you the experience of a spa cleaning. Most of the Vega face pack brush reviews are good indicating the quality of the product. The most attractive feature of this facial massager is that it comes with 5 accessories which help in serving multiple functions. 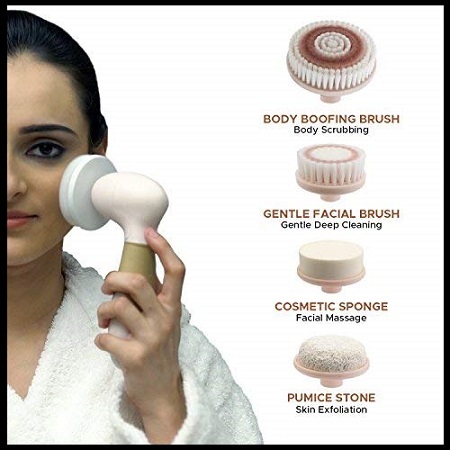 Those five parts include A makeup sponge which helps in massaging your skin, a latex soft sponge to massage your eyes and cheeks, a rolling massager which helps in preventing the skin from aging, a crude polish accessory to remove the dirt in the tough skin and a soft brush to eliminate all the scurf clings which is present on the surface. It also helps in removing the extra loose skin and also the hard skin under the foot or elbow. It also works on double batteries. 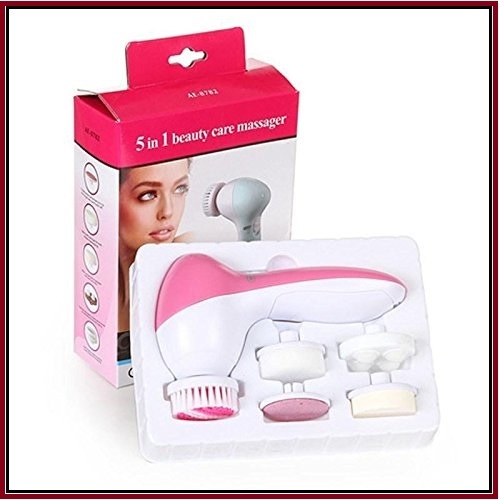 It is also a 5 in 1 facial brush which comes with five parts containing Soft sponge cleaning head, Soft massager head, Brush cleaning head, Ball massage head, and Sandpaper massage head. These five parts enable the multiple uses such as removing the skin dirt etc. You can use this product to massage your head, face, and eyes. It gives the best results within a week of its usage. It is very compact so it can be better used for travel purposes. You will get an effect of having a comfortable massaging therapy after using this product even for once. The power source is 2*AA batteries. This portable face cleanser has four parts and it can be rotated to 360 degrees. As it can be rotated on all the sides, it helps in the relaxation of the facial muscles and skins. The four parts which come with this face cleanser are as follows:1. A body brush which has an extended handle and this helps in cleaning every part of the body with much ease 2. A cosmetic sponge which is helpful for massaging and moisturizing. 3. A facial brush for the usage in the face. 4. Pumice stone to use under foot or elbow. This product is meant for the daily use and this will go well for all the skin types. This product will be greatly helpful in removing the dead cells and gives a youthful appearance. It can be used for all the types of skins ranging from dry skin to acne-prone oily skin. The dirt which has penetrated deep into the skin is easily removed. This keeps the skin healthy and hydrated. It comes with five accessories such as crude polish accessories, makeup sponge, latex soft sponge, rolling massager, and a soft brush. The one important thing that makes many customers select this product it is less expensive compared to many other products in the market. This is also easy to use. 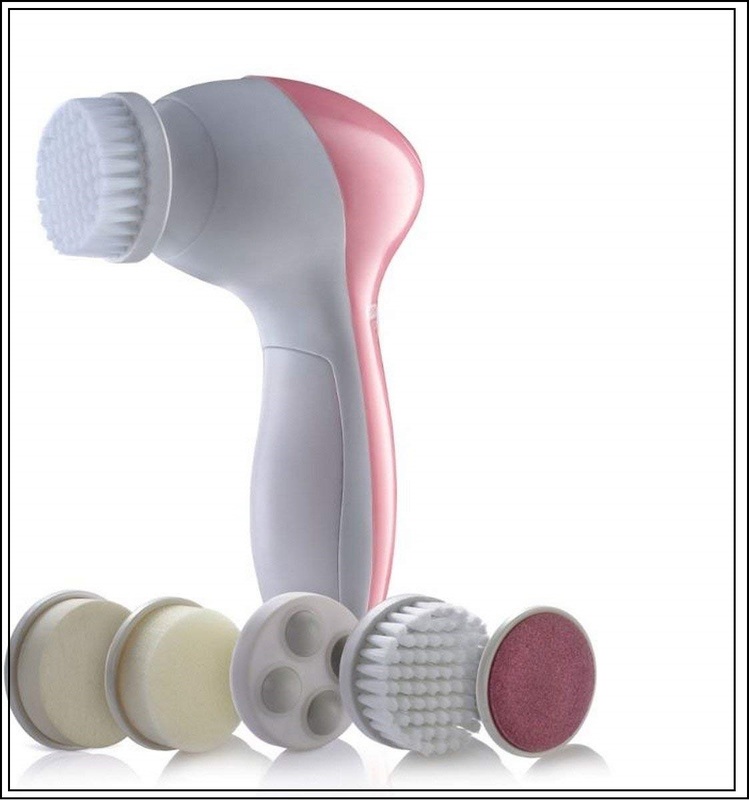 Srxes electric facial cleanser can be considered as the perfect electric facial pore cleanser which comes with the seven attachments that can be used for different purposes. 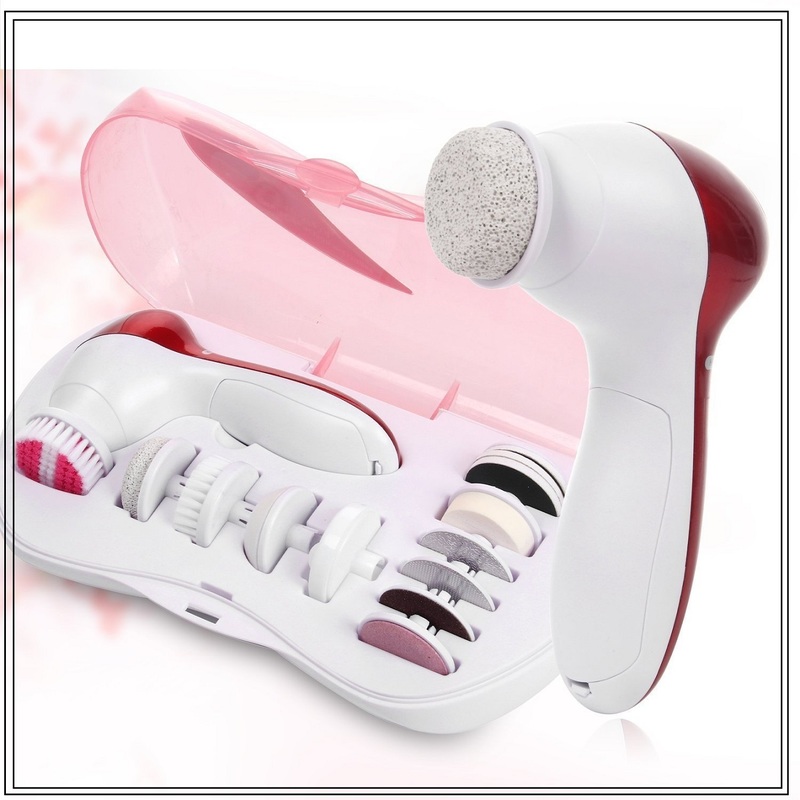 The various attachments which are included in this product are dermabrasion brush which helps in eliminating scurf clings on the surface, make-up remover sponge, crude polish, rolling massager for increasing the circulation and a latex sponge for polishing the skin. The attachments include a dermabrasion brush to clear scurf clings on the surface, make-up remover sponge, crude polish, rolling massager for improving circulation and a latex sponge for cleaning the skin. It helps in removing the wrinkles which would have a great effect in improving the skin texture. In addition to this, it also helps in improving the elasticity of the skin. It is a handheld device which makes easy to use. It further helps in boosting the metabolism of the skin. It helps in reviving the softness in your skin. The product is also excellent in removing the blackheads and the fine lines. The five types of attachment that comes with the product are Rolling massager, makeup sponge, Crude Polish accessory, soft brush and Latex sponge soft. It had got two settings: low can be used for the daily use and high for the exfoliation.